Beautiful hair doesn't have to cost a fortune and while salon products are lovely to have and to use, they aren't necessarily wallet friendly. It's nice to know that when the budget is tight, there are good hair care and styling products at an affordable price right at my fingertips. OGX is Beauty, Pure & Simple. And all of the products go for well under ten dollars, each. I've pulled together some of my current OGX favorites to share with you. Got dry hair like I do? Ya need leave ins, Doll. Trust me, your hair will thank you. 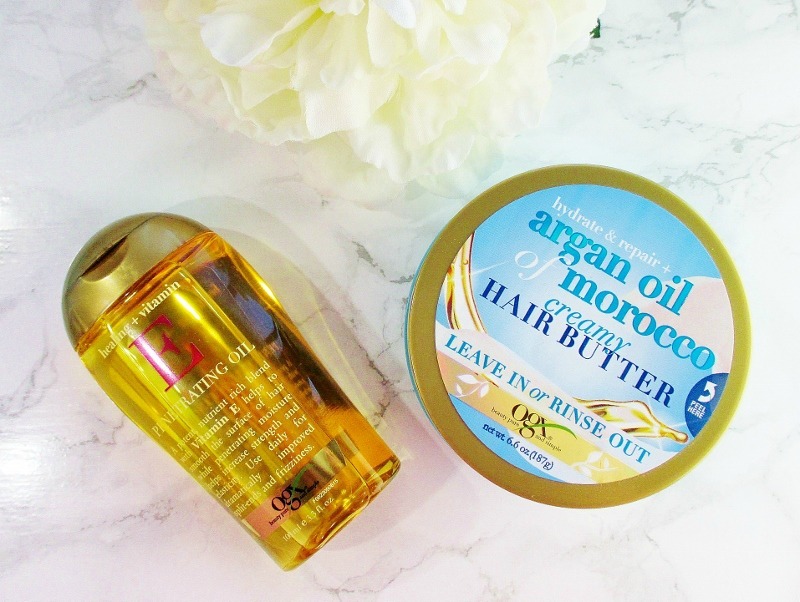 OGX Hydrate + Repair Argan Oil of Morocco Creamy Hair Butter Leave In or Rinse Out, $8.99. Right after washing, I like to tap my fingers lightly on the top of the product, rub my hands together to warm and loosen it up and then work it through my lower length and ends. This product is deeply hydrating and a tiny bit goes a long way and makes my dry ends feel alive, again. OGX Healing + Vitamin E Oil, $7.99. 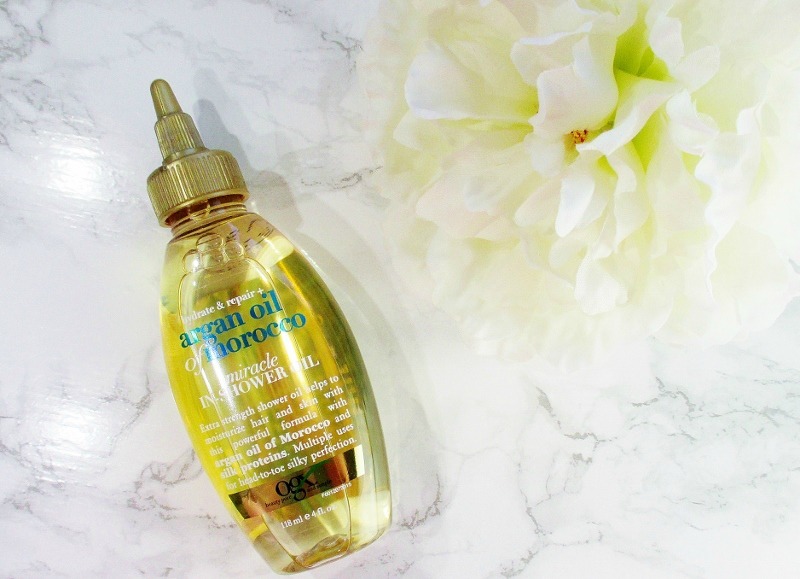 This lightweight, penetrating oil can be used before washing, or after in wet hair or in dry hair to smooth flyaways and boost shine. Who's got wurls? I've got wurls. 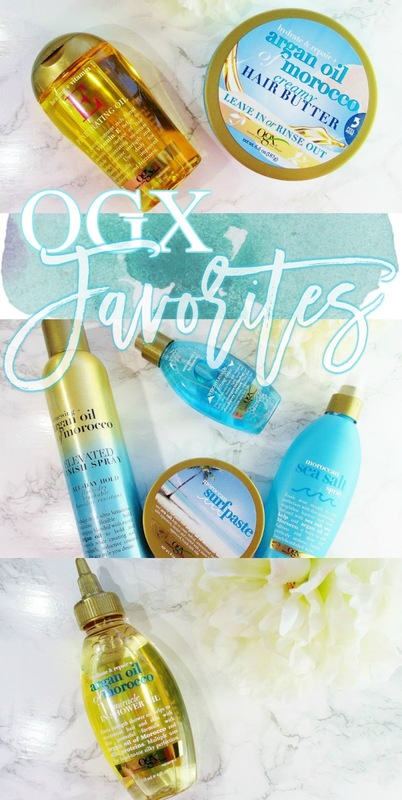 And to create a head full of soft, swirly, beachy waves, I grab these OGX goodies out of the basket and put them to work. OGX Anti Gravity + Hydration O2 Weightless Oil and Lift Tonic, $7.99. A little of this misted in at roots and under layers gives my hair lots of lightweight lift and a little extra shine and softness and makes my hair look ruffled by a sea breeze. Spritz my wurls and scrunch them with OGX Moroccan Sea Salt Spray and I get more defined, piecy waves. OGX Moroccan Surf Paste, $7.99. A little of this fresh, yummy scented stuff on my fingers gives my hair that "been hanging out by the shore" look and feel. OGX Argan Oil of Morocco Elevated Finish Spray, $9,99. A quick mist of this lightweight finishing spray holds my hair in it's given style without making it feel stiff or sticky. Got dry skin? I do! Some tragically dry skin. After I wash and rinse off my body wash, I grab OGX Hydrate + Repair Oil of Morocco Miracle In Shower Oil $8.99, twist up the cap and squeeze. A fine line of oil goes right where I direct it to be smoothed over my skin then given a quick rinse. Pat gently dry and hello, soft skin! And, this stuff doesn't leave my shower floor feeling like an oil slick. But I still step with care. 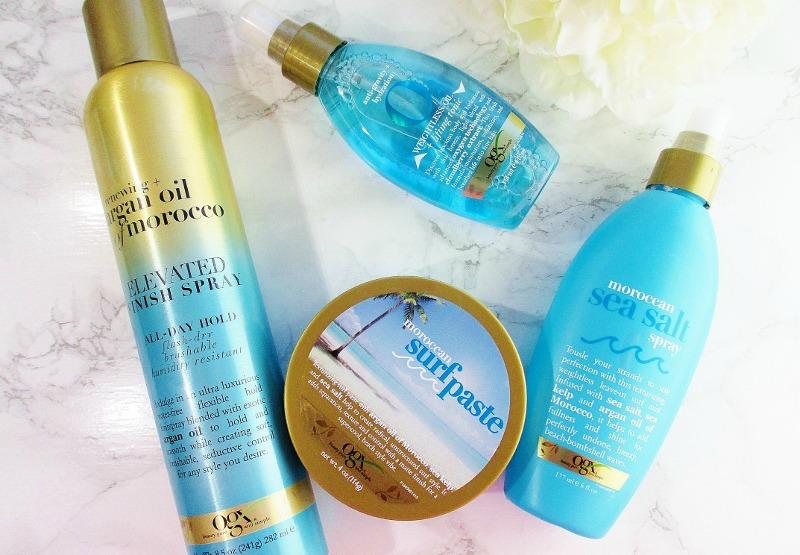 Have you tried OGX hair and body care products? If you would like to try, they are available at Ulta Beauty in store and online and at Target. If you order your goodies for delivery to your doorstep, don't forget to use EBATES and get paid to shop! If you haven't yet joined, just click the link. It's free and you can start earning cash back, on your very first online shopping trip. OGX products are sulfate and paraben free, are PH balanced and OGX does not test either their finished products or their ingredients on furry creatures. If you are allergic to gluten, read about that here.